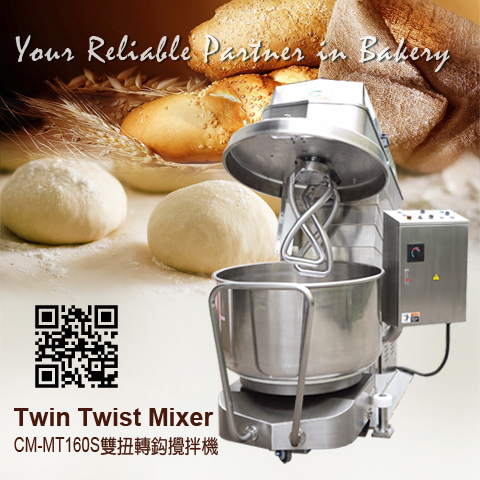 CM-MT160 Twin Twist Mixer is design with removable bowl is suitable for dough processing; saving mixing time than same capacity spiral mixer. The mixer upper head is designed to lift up by hydraulic power to allow bowl trundle removable for exchanging the mixing procedure. There are two stages kneading speed and two operation mode which are automatic and manual, additionally, there is auto timer-device for user’s adjusting. Guard cover is one-piece sealing construction to comply with safety, hygiene, outlook and dust emission standards, and emergency stop button…etc. Machines are based on excellent die-casting technology and with non-dust paint coated finish; Optional: Stainless steel material. 1. Removable design to meet with the removable demand. 2. Hydraulic opening system with protection equipment, good for safety usage. 3. Automatic adjustable stirring bowl design. 4. The rotation of bowl provided with direction change. 5. 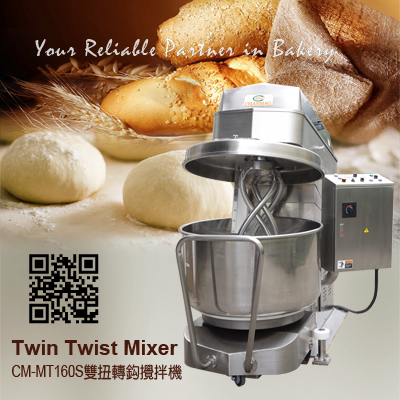 Can be using in bread or cookie production mixing. 6. With scraper, help make all material more uniform and concentration.